Hello, my name is Eleanor O’Kelly-Lynch, owner/manager of Golden Apple Training. 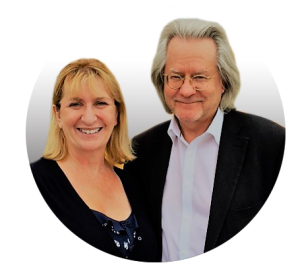 Some years back I read a Sunday Times profile on Dr. A.C.Grayling, CBE, (pictured with me on the right) world renowned author and philosopher. In it, he tells us that we have about 1000 months on planet earth…if we’re lucky. Make the best of it he says, make it meaningful. He’s right. Most of our lives are actually spent at work so to me, it makes good sense to make that work day meaningful, productive, satisfying and as enjoyable as possible. This principle helps to inform Golden Apple’s training philosophy – giving participants the tools to enhance their performance and relationships at work. Enthusiasm. We endeavour to bring enthusiasm into the training – if it’s enjoyable, lively and engaging, people learn more and apply the learning. And enthusiasm is a learned habit that generates energy and meaning n the workplace. Flexibile. We are happy to adapt to your constraints. If you need evening or Saturday training, we’ll do it. If you’re group is much bigger than expected, we will work it out. If you’re not sure what you want, we’ll listen and advise. A pre-course meeting to explore ideas will cost you nothing. Innovative. You won’t get cookie-cutter training with Golden Apple. We design and customize the course material and subject matter you want to cover whether it’s about selling, customer service, better workplace communication, managing stress or developing your personal power in the workplace. A graduate of University College Cork, I have 25 years’ experience in third level teaching, field sales, training and sales management. In Golden Apple, working across all sectors, my primary aim is to help people to unlock their potential and to maximize their performance. Training should be practical, inspiring, interactive and relevant – time out where people can self reflect, learn and stretch themselves in a comfortable environment. Nominated Glanmire Person of the Year in 2005 and Winner of Glanmire Person of the Year (Environment Area) 2006, I’ve completed three fundraising cycles for the Irish Guide Dogs in Cuba, France and Italy and was a volunteer for the Samaritans for 7 years. I am currently on the Board of Management of St John’s Central College and am newly appointed ‘Ireland Coordinator’ for the UK based CDLS Foundation.